In cooperation with the Yad Vashem International School for Holocaust Studies and Yad Vashem Museum Traveling Exhibition Department, Terraforming translated ready2print exhibition “Shoah – How Was It Humanly Possible?” for use in Serbia. The exhibition deals with major historical aspects of the European Holocaust. Ready2print is an innovative concept in museum quality exhibitions, provided as high-resolution digital files, easy to distribute, print and display. The concept developed by Yad Vashem is now available in Serbia, too. In addition, focusing on the Holocaust in occupied Serbia, Terraforming developed a 6-panel-set titled “Some Words About the Holocaust in Serbia” that can be used as a supplement, or as a stand-alone exhibition. “Some words about the Holocaust in Serbia” is intended to be printed, exhibited and used as an addition to the Yad Vashem’s exhibition “Shoa – How Was It Humanly Possible?”, or it can be used as a separate exhibition, or a publication, or digitally (PDF). This material is not meant to give a comprehensive and thorough overview of this complex period of history, but to contribute to learning and spreading of knowledge about it. It contributes to better understanding of the common elements and processes characteristic to the persecution of the Jews all around Europe compared to the model and processes implemented in the occupied Serbia and Yugoslavia in the same or very similar way. On the other hand, this material can point to some historical experiences characteristic of the persecution of the Jews in the occupied Serbia, thus contributing to distinguishing particularities of the Holocaust in the occupied Serbia in the wider context of European Holocaust. • Historical Archives of the City of Novi Sad. 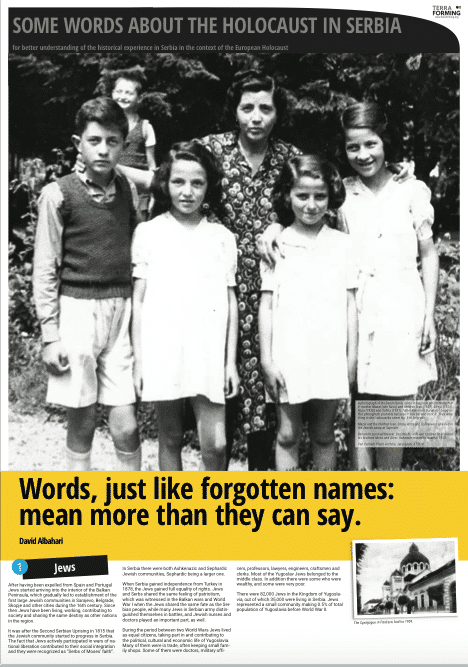 English version of the exhibition “Some Words About the Holocaust in Serbia” is available for download here. Serbian versions of “Shoah – How Was It Humanly Possible?” and “Some Words About the Holocaust in Serbia” are available for download on Terraforming’s website.